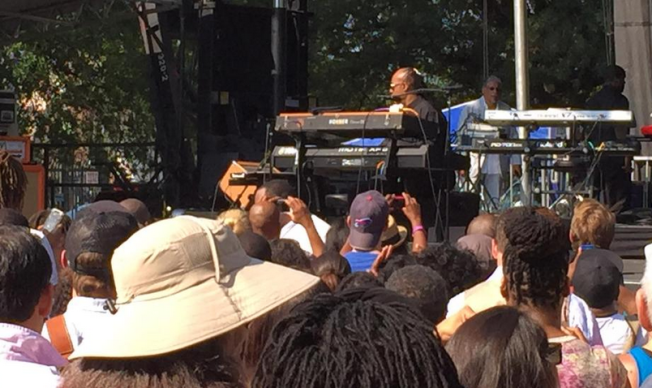 Stevie Wonder Performs Pop-Up Show in D.C.
What a way to start a Monday! Singer-songwriter Stevie Wonder dropped by the Armory Mall in front of RFK Stadium in Washington, D.C. to play a surprise pop-up show Monday morning. The Grammy Award-winning hitmaker performed several songs over 45 minutes, including "Love's In Need Of Love Today." The appearance was part of a news conference promoting Wonder's "Songs in the Key of Life Performance" tour. Monday's performance was advertised just hours before it happened. The first 1,000 attendees received free doughnuts. The Songs in the Key of Life tour comes to the Verizon Center Oct. 3. Events DC presents #AWonderMoment with Stevie Wonder, 2-3 song performance, 10am TODAY! First 1,000 get donuts courtesy EventsDC.